I was about to book some concert tickets for when Iron Maiden will visit Sweden next summer on their SOMEWHERE BACK IN TIME WORLD TOUR 2008, where the stage set will be inspired by the Powerslave era. The interest for Iron Maiden tickets is huge in Sweden, and they’ve been very popular here for a long time now. They will be playing two stadium gigs in Sweden, one in Stockholm and one in Gothenburg, for a total of over 80 000 people. Yesterday the tickets went on sale, and most people buy their tickets through the Ticnet web site. However, that web site has become increasingly infamous because of it’s poor performance and lack of stability during major ticket releases. They use a kind of, I think, iframe-based queuing system where it says how many more minutes you have to wait before they let you into the web site to book. I tried accessing the web site with three different web browsers, my brother at his location with another, and a friend at yet another place. All our sessions crashed and/or timed out. The iframe fails to load or it loses the connection to the web site altogether. And when happens then? You lose you place in the line. Another thing that bugs me here is that the tickets can get sold out, and still your web browser just keeps on queuing till it gets in, even though the tickets are since long sold out. If the tickets are gone, why not send them to a hard-coded web page which informs them about this, instead of letting them waste hours just to find out that there haven’t been any tickets available since several hours? I mean, really, shouldn’t a web site, selling tickets to high-profile events, be able to take some load? I understand the technical implications of getting a lot of sudden visitors, but this happens every time they release tickets. It shouldn’t come as a surprise that certain events are very popular, and technically, they must be aware that their current system just can’t cope. What really annoys me is that everyone is dependent on this web site to work, and I really feel sorry for all the people taking time out from their jobs or schools to desperately wait in line to a web page that literally betrays them when they least expect it. 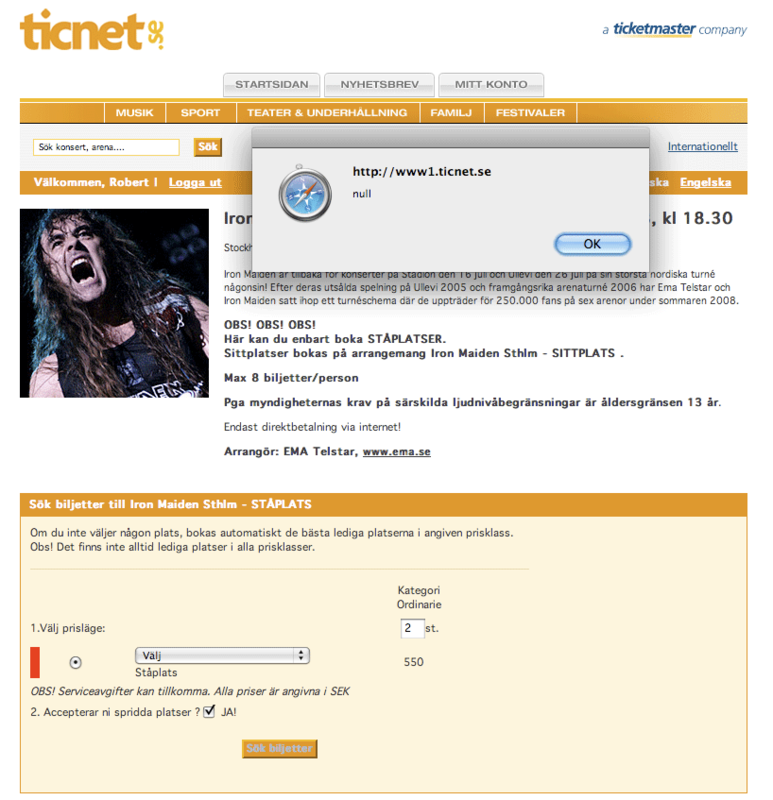 Also, Ticnet have implemented a feature which only allows you to buy tickets using an Internet bank account connection, if you want to fetch the tickets at one of the myriad of representatives available all over Sweden. If you want to pay with a credit card, you can only collect the tickets at their very own representatives, of which there are maybe 30 all in all in Sweden. This is to prevent black market scouts to buy up a lot of tickets, but apparently this only affects people actually wanting to go to the concert, and not the ones selling the tickets for steep prices. 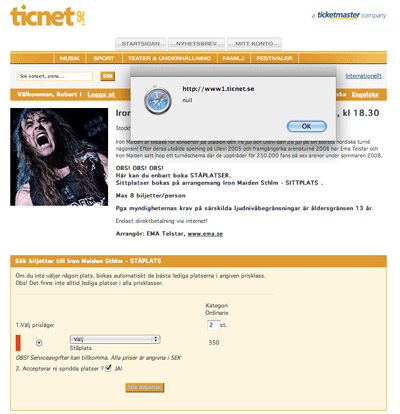 Swedish web site Biljett Nu (meaning: Ticket Now) are one of these organizations focused on buying tickets from Ticnet and then selling them on to private persons, collecting a lot of money in-between. Hell, they even let you pre-order tickets to an event! All of this affects the little man: the one who’s trying to get tickets the legitimate way by queuing, and who also normally can’t afford exorbitant prices, since Ticnet can offer a fair manner of selling the tickets in the first place. And those are the ones missing out on the event, and they can’t turn to anyone other, since Ticnet has a monopoly on the entire situation. This means that Ticnet can offer, or rather neglect to offer, any level of service they want, and everyone still have to turn to them to get tickets. Luckily, I had a number of friends waiting in line outside of real stores selling the tickets, so I got a hold of some for me and my closest ones. And later yesterday, I heard all kinds of tales of people going to stores to buy tickets. No lines, no nothing. Just walk in and get the tickets, and Zip-a-Dee-Doo-Dah, off they go. I’m happy for their sake, but a bit amazed by the situation. I think this is a prime example of when poor Internet infrastructure fails, and people turn to regular standing in line and going to stores downtown instead. Sad, really, and it gives web sites and the Internet in general a bad reputation of being unreliable. Great work Ticnet, really. I applaud you. I definitely know and relate how to things can go wrong in a web site, but seriously? Object detection, anyone? Defensive coding? Hell, even try...catch would have made me happier. Hey Robert, if you think that the forward-facing part of ticketing is messed up, you would be shocked to learn what happens behind the scenes. I and a friend also were going to see Iron Maiden on the same tour but in Toronto on March 16. Unfortunately, the phone call to TicketMaster got messed up and we didn't get floor tickets but seats at the opposite end of the stadium from the stage. I don't know if we will go. Looking for your comments on the performance. I really wish someone would sort out ticket companies and their websites when high profile events are released. I only made it to Glastonbury this year because someone I knew, knew someone else who had got through and managed to keep their connection, allowing them to buy tickets over and over. And there's no way of buying them in person at any shop! It happens every year, you would have thought they would do something about it by now! is there a niche open for someone to develop a kick arse usable booking system that could be flogged off to TicketMaster and others? I ask that as I've heard a lot of similar discussion over the last few years too. Ticket sales for major events in Denmark is just about the same … the monopoly vendors servers go down in flames. Yeah, I kind of figured I wasn't the only one not pleased with the poor performance of ticket-selling web sites. Your experience sounds very similar to the Colorado Rockies World Series snafu a few weeks ago. The online ticket vendors got them but the core rockies fans didn't. And don't believe a thing when you see that countdown timer. Hit refresh often to get in. Many of us obediently waited in the digital queue and that countdown timer is nothing but fraud. I had a similar experience with Lippupalvelu (Finland's answer to Ticnet I presume) some time ago when trying to get tickets. I'd already gotten in the queue and reserved seats but the system timed out when trying to enter my choice on paying the tickets. Yeah, apparently it seems to be as bad pretty much in every country. It really amazes me.